Observation - Cherry with Kanzan graft - UK and Ireland. Description: This cherry grows in Overdown Road in Tilehurst, Reading. It has predominantly the standard cherry flowers but a branch has been grafted on (at top right in fourth picture) which bears flowers of a Japanese ornamental cherry known as 'Kanzan'. 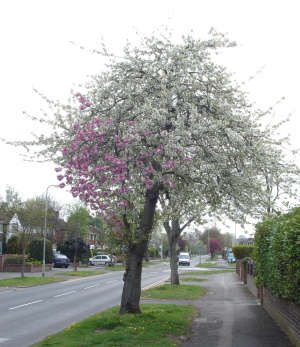 This cherry grows in Overdown Road in Tilehurst, Reading. It has predominantly the standard cherry flowers but a branch has been grafted on (at top right in fourth picture) which bears flowers of a Japanese ornamental cherry known as 'Kanzan'.